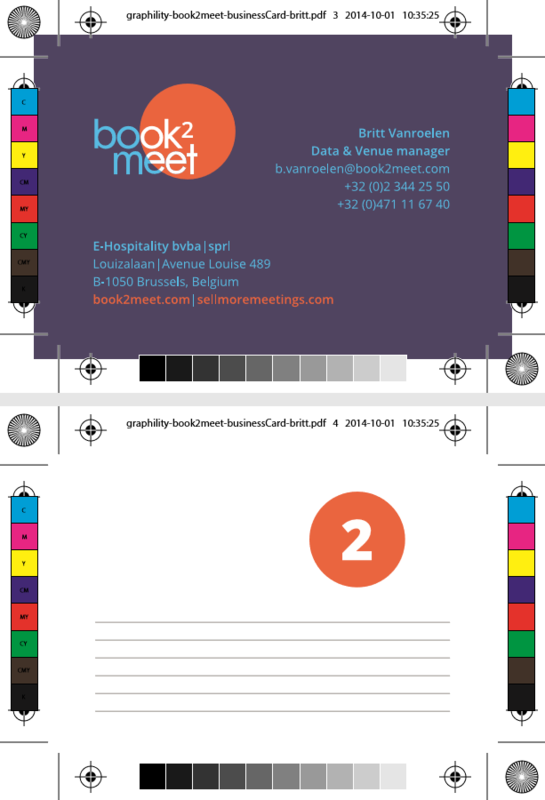 book2meet was the leading platform to book meeting spaces online across Europe. Initially commissioned for User Experience, graphility stepped up to the whole experience design spectrum, instilling the service with easy tools and a look as modern as its values. Here’s our case study after the mission. Meeting spaces around you often lie idle. For example, hotels not only have rooms: they also have corporate space for business meetings and similar events. book2meet conceived the idea of putting these spaces to good use, renting them to people who would need them for a couple of hours. The startup wanted to reach out to hoteliers to catalogue their inventory, thus creating a meta search for meeting spaces. Anyone could visit the site to book an available space nearby. If they found a location that matched their requirements, they could rent it on the fly. book2meet company was performing moderately but not up to stakeholders expectations. They wanted to take further steps to improve and serve their clients better. 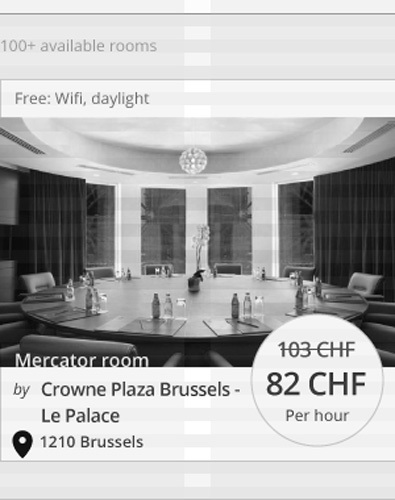 Unclear pictures of hotels or meeting rooms did not establish an attractive catalogue. Photography could be improved. The front-end needed improvement: users were confused by some of the features on the interface. The existing back-office for property management was robustly designed with big corporations in mind. This undermined smaller players who turned out to be the initial clients. Property managers faced complications while interacting with the platform. The company was looking to grow actively in multiple countries across Europe. This added complexity like localization, i.e. translating every web page to the local language. It meant a longer process of people translating, with more costs and quality checks to vouch for correctness and SEO. Another touchy area was pricing and currency conversion for multiple countries. The UX complexity that came along with these is that creating an interface that accommodates multiple languages requires more attention than designing for a specific language. To solve these challenges, the company decided to simplify the onboarding process. If property managers became clients, book2meet would take up the registration on the site, saving them time and effort. While this improved the client inflow, it increased the activation cost for book2meet. Moreover, the process remained complex even though done in-house. Likewise, picture quality sent by hoteliers did not improve either. Hence for the users, the interface remained unfriendly causing a sub-par user experience. While book2meet strongly believed in its concept, it needed refinement to optimise conversion. A rejuvenated team of Ukrainian IT developers, with sales and design based in Belgium was the first step to start fresh. What book2meet realised at this point is essential for many companies: IT and design are two separate entities. book2meet decided to hire somebody specifically to improve their design, and that is when our creative director Hector Hurtado joined the new team. 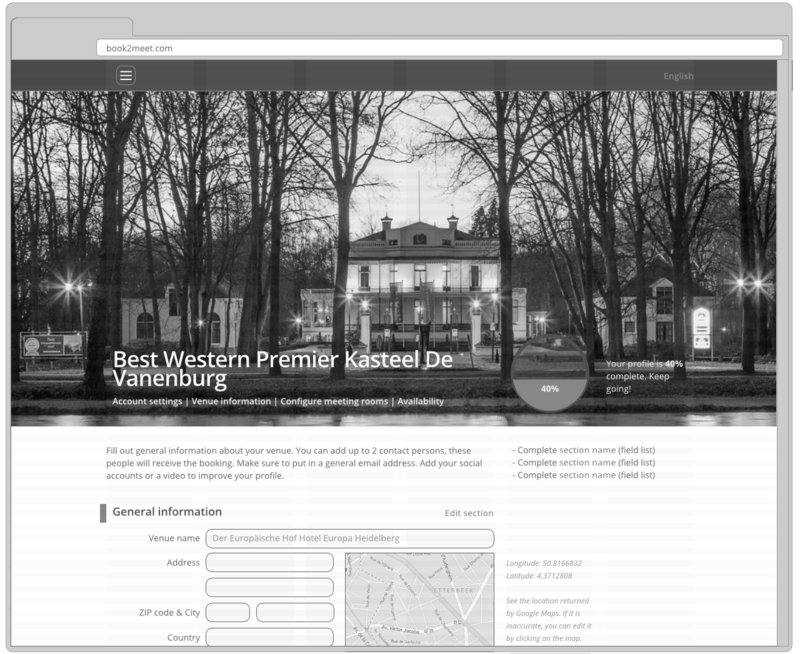 The initial phase foreseen was to redo the front-end to improve the user experience: make it simpler and more appealing. graphility being well versed with Agile, Hector took up the responsibility of being the product owner for the front-end, while the IT director would focus on the back-end. As a usual first step, graphility aims to understand the existing pain points for any brand. We started analysing the website: what was good, what could be improved, what could we learn from previous analytics. The next most crucial step was to clarify the vision of the company. The aim was to gather around a core vision, making sure that every stakeholder was on the same page. Then we proceeded with benchmarking to investigate the brand’s competitors. Our research noted who the brand identified as competitors, as well as those we identified ourselves. We reviewed all the competitors’ websites trying to gather points where they were excelling, thus performing a comparative analysis between them and book2meet. As a result, our research indicated new players who were doing well overseas. Discussing with our client, we mutually mapped out areas of improvement. 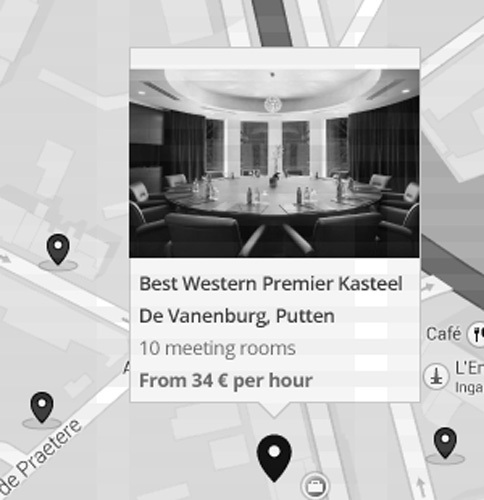 This included focusing on unique selling points (USP) such as faster time to booking, free cancellation policy and search by geolocation. Consequently, book2meet highly appreciated Hector’s concepts so we moved on to research who competitors were targeting. This meant shifting our focus now from the business to the user side of the story. graphility co-created with book2meet in identifying the right target group for their services. We decided upon targeting the niche users: startups and free-lancers on the move, with little to no space, in need of meeting with their clients for a couple of hours. Meanwhile, we agreed to design the website in a way that would still allow mid-sized players to book for services as well. Scalability was paramount to early stakeholders. We introduced the concept of personas during the research phase. 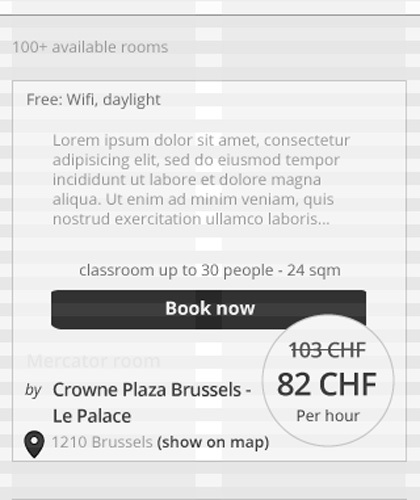 We created two sets for both ends of the business model, hoteliers and end users. Among those identified were freelancers, businessmen looking for a formal meeting, and personal assistants booking meetings for their boss or their department. Other personas included property managers becoming clients and making their space available for rent. In the quest of doing things right from the start, book2meet was also planning to rebrand completely. The company revamped its name from lastminutemeetingroom to book2meet. They wanted to hire somebody for the rebranding as well, being dissatisfied with their existing branding partners. By this time, book2meet was impressed with our design thinking and front-end work, and offered graphility a second contract. Therefore, this reinforced the front end work, now with the added chance to craft a company logo and colour palette giving us further control over UI design. Through her photography, Marta Hurtado sharpened the identity of the company, presenting book2meet with quality pictures in their “about us” page and show the office space as well as creating a brand image for their audience. 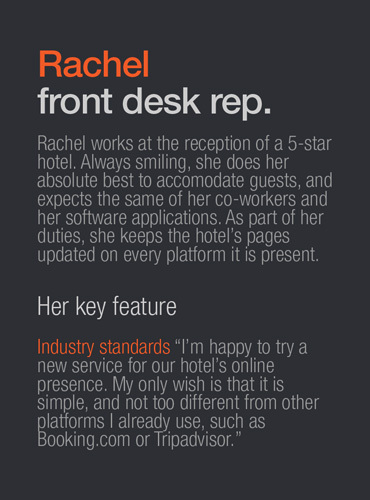 Lastly, to completely improve the overall experience design we also suggested book2meet rework their back office. Hector posited that if book2meet could have a quality interface which hoteliers themselves could manage, it would save a lot of time and cost to the company. At the time, it was their own people who were in charge of registering the hoteliers due to the complex procedure. Again, Hector’s concepts were well received and accepted. Therefore, we helped our client improve the back office features with significant expertise and elegance. In closing, the entire project spanned over a period of 15 months which included the front end design, the whole branding process and the back office makeover. The front end design, the branding and photography spanned approximately 9 months. The back-office features took between 12 to 15 months. 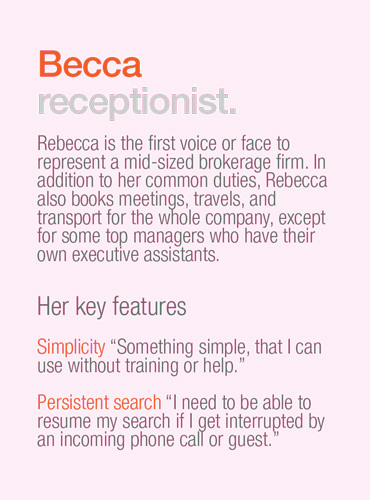 Lastly, important to this case study is to note our way of working. graphility excels at providing clients with a single best proposal rather than a collection of dubious choices. To this end, we arrive at our conclusions after in-depth research and analysis in order to provide our clients with our best creative solution. If we are the experts and believe in our work, then let’s co-create the best interest for your brand. This is where we stand out from other agencies: we believe in going the extra mile and deciding together what is the best solution for you.